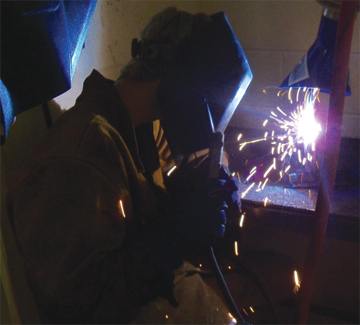 The Welding program prepares individuals to apply technical knowledge and skills in Shielded Metal Arc Welding, Gas Metal Arc Welding, Gas Tungsten Arc Welding, Flux Core Arc Welding, brazing, Plasma Arc Cutting, and Oxy-fuel cutting. Hand, semi-automatic and automatic welding processes are also included in the instruction. Students learn workplace safety practices, types/uses of electrodes, welding rods, study of the physical and chemical behavior of metallic properties of metals (metallurgy); blueprint reading; electrical principles; welding symbols; use of equipment for testing welds by non-destructive methods and destruction and hardness testing; use of portable grinders; positioning and clamping; use of manuals and specification charts; and welding standards established by the American Welding Society. Students have the opportunity to become AWS certified and to take the National Occupational Competency Testing Institute (NOCTI) exam. Students scoring advanced on the NOCTI exam will receive a Pennsylvania Skills Certificate. Welders, Welding Technicians, Welding Supervisors, Welding Inspectors, Quality Assurance and Non-Destructive Testers, Welding Estimator, Repair Technicians, Construction Welders, Industrial and Production Welding, Welders Helpers, Welding Sales and Services Representatives.